It’s tough, to type words on a computer screen, knowing those words will be the last you’re going to publish as the editor-in-chief of a newspaper. I’m aware that a majority of students on campus may not even read this, out of the 11,399 students enrolled this semester, we only distribute 600 copies on campus per week. And sometimes we happily return from distribution with only 30 papers leftover, other times, over 100. 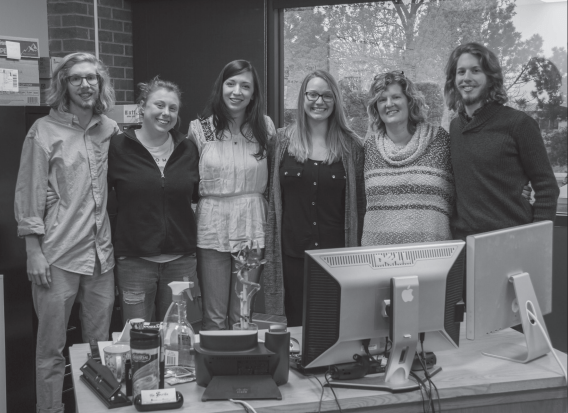 The Scribe, the UCCS student newspaper, is not always on the forefront of every student’s mind. I’ve known that since I became a reporter in spring of 2014. But I didn’t keep writing for students who didn’t care about what happens at UCCS. I didn’t keep working and moving up at The Scribe for students who have never understood how much work the staff puts themselves through week after week. And I was happy to pass along every compliment that students gave to our staff, because amidst the criticism, the staff deserves to know that students are affected and impacted by their work. No, we’re not perfect and we don’t get every article right. We’re students, and we are learning. That’s the whole point of being a student paper. I stayed, like the current Scribe staff members and many before me, because I care about what happens at the university I attended for five years. I wanted to share that information with other students, staff and faculty at UCCS the best way I knew how. I was recently interviewed (it’s weird being the person answering the questions) and asked what I would do if time and money were not a factor in my life. At the time, I didn’t answer truthfully; I just said what I thought the interviewers wanted to hear. Days after the interview, I realized that if time and money weren’t a factor in my life, I would do exactly what I do now: be a journalist. My hope for after I graduate is that UCCS will see the value in student media, support us and take every opportunity to interview with us and educate us, whether you’re a student, professor or faculty member. Even if small, changes have been made on campus due to articles published in The Scribe, whether it was one of our opinions or students who came to us with a concern. When you deny student journalists the chance to interview with you, you’re denying them and yourself the opportunity to educate the other person and meet someone new; it’s not always about the article. I said it in my first editorial and I’ll say it again—The Scribe is made up of a talented team of students who work far past their limits to make sure we print a paper for you every week. While I’m sad to leave what has been my heart and soul for the past three years, I have full confidence in the next set of staff who will take over this fall, and in Hannah Harvey, who will successfully lead the newspaper and the next Scribe staff. Without our writers, editors, photographers, designers, ad reps, our business manager and our website and social media team, we couldn’t successfully inform our students on what they should know about our campus. Without every student, professor and faculty member who took a moment to support and encourage me throughout my college and journalism career; I could not have successfully made it through this year as editor-in-chief. And without The Scribe adviser, Laura Eurich, who always supports our newspaper and our staff, advocates for ethics and holds our newspaper to a high standard, we would fail. As for our readers, who pick up a newspaper every week or every once in a while, we wouldn’t have a purpose at The Scribe without you. So thank you for staying informed, for sending emails and telling us in person what you think about The Scribe, it means more than you know.